Who loves avocado? 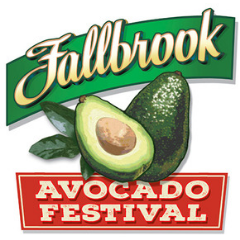 Come and experience the Fallbrook Avocado Festival on Sunday, April 14, 2019. Enjoy and discovered the joys of guacamole! Since the 1960s, tens of thousands of avocado lovers converge in Fallbrook, located in San Diego’s North County Inland to sample avocados, check out the crazy cooking contest entries, buy funky avocado-themed gifts and enjoy bands, live entertainment and friendly beer gardens. Come prepared to visit the many craft and food booths – you can never go hungry at the Avocado Festival. Colorful booths line Main and Alvarado Street featuring unique clothing, hats, arts, crafts, jewelry, and farm-fresh produce for purchase. A variety of bands and other live entertainment are offered for the pleasure of festival-goers. Beer gardens and numerous food vendors cater to every whim.